SAS makes a fair amount of reward inventory available, not only between North America and Scandinavia, but also throughout Asia from their hub in Copenhagen. North American flights come out of Copenhagen and Stockholm as well as Oslo. This only problem is SAS only has 16 long haul aircraft at this writing, 8 A330 and 8 A340 planes. Therefore the destinations are limited. They also fly a 737 to Boston operated by Privatair. Using United points for a flight from Stockholm to Chicago will set you back 70,000 in business class. SAS will typically charge around $2,500 for a round-trip but when buying a one-way you get to pay $3,300. Based on buying a round trip you'd spend 140,000 points and get a value of .018 and the one way is .047. My value was different based on the journey, however if I was going to simply fly from Chicago to Stockholm and back, redeeming 140,000 points would not be the best use of these points. This trip, SIN-BKK-ZRH-ARN-ORD flying Thai, Swiss and SAS was done online. SAS has a mobile app. Basically it's useless except for check-in. But I used the Swiss app for my check-in. Also SAS doesn't have seat selection on their mobile app, or website. You have to call. However if you have an itinerary that includes Lufthansa with your SAS flight and your booking reference is the same, you could assigned the SAS seat from the Lufthansa mobile app or website. Swiss 1250 arrived on time into Copenhagen. With a few hour layover I decided to walk around the airport a bit. Soon it seemed I was in a shopping mall and not the airport. Wood floors. Time to check out the SAS Business Class lounge. It's a small lounge shaped as a "L". I spotted a shower room but it didn't appear to be too elaborate. The view out the windows was the departure check-in counter. And a quaint little room in back. There was more food than people. A number of Asian dishes were offered. I didn't see any flights headed that way. And a calorie chart for those salad health conscious folks. Serve yourself draft beer, wow. Just don't use the glasses on the wall. I love the SAS business class cabin. A slight offset to the seats in each row still allows for conversation between window and middle section occupants while maintaining privacy. Two business lavatories are located at the back of the cabin by the galleys. The front lavatory is crew only and no one is allowed in the front area before row 1. This certainly makes sense for security purposes. While not as spacious as on their A340, the lavatory is larger than what you'd typically find on a 777 widebody. The toilet is on an angle so you get some room to change clothes if you like. And you get a view. But the luggage bins are not as big as on a 777 or A340. My second time in this seat and I like it more. While I haven't experienced every business class seat on the market, this seat is at the very top of ones I've tried for comfort, privacy and sleeping. My original seat was 2A. Somehow the pod got damaged and had s light rock to it, almost like sitting on a stool where one leg was slightly shorter than the other three. While I could have stayed, they graciously allowed me to move to 6A. The pod was cracked, probably not the cause of rocking. A shame as these are fairly new installations. Even row seat that hugs the window. The Vantage seats on 767 aircraft and all Vantage XL seats all have a similar layout. Alternating rows where the window seats hug the window then the next row window seats hug the aisle. While there isn't any difference in the space, with the seats that hug the aisle you are right next to traffic as well as carts being pushed through. Seats that hug the window are more private as well. The center seats. This divider does not move. Well designed pods allow for useful space as well as some innovative ideas. Hang your headphone with easy access and the jack within reach without any physical contortions. Electronic ports as well as USB charger and audio controler (IFE is touchscreen) with a place to lay your device while reachable yet out of the way. Cubby hole for a bottle of water and a second drink stabilizer ring fenced in for those turbulent times. Simple touch seat controls and reading lamp along with overhead light control. Tablet/reading material holder, coat hook on seat back. Or room to widen out. Stylish Hastens bedding; mattress pad, duvet and generous pillow. With this being a day flight apparently I was one of the few who wanted to catch some zzz's. If I had a complaint about the flight it would be the attendants allowed open windows throughout. They also never dimmed the lights. Not only did it affect sleeping it made for viewing the IFE difficult due to the glare. I can't ever remember a long haul flight where they didn't shut all the windows. I still slept. A standard fare amenity kit was offered. I don't think I opened it. Business class PJ's would put SAS at the top. I'm not holding my breath. 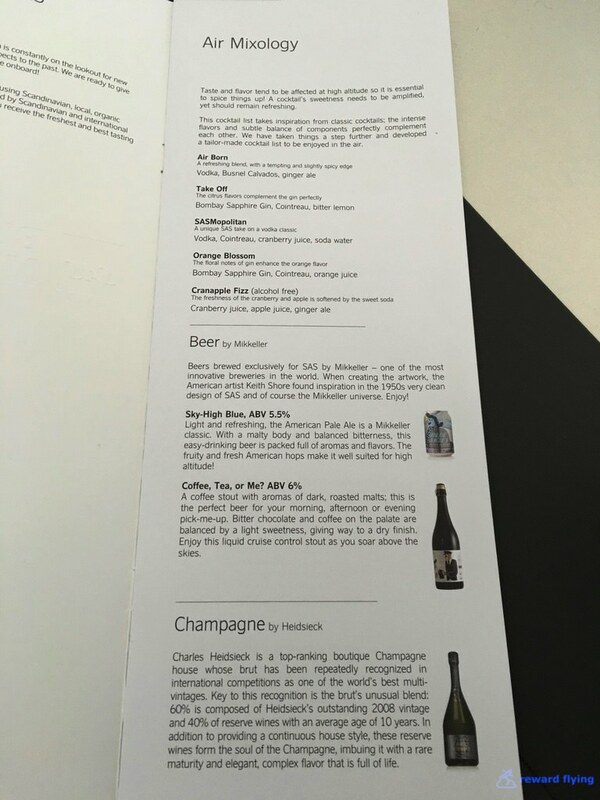 Charles Heidsieck Champagne appears to be the popular Star Alliance carrier choice for champagne. SAS also has it's own beer crafted for them appropriately called Sky-High Blue. 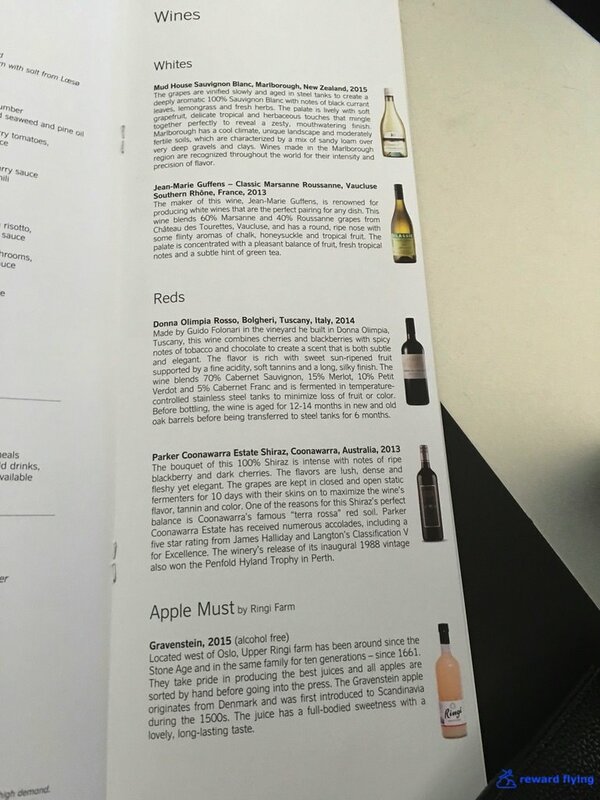 Only two vintages for both white and red were offered. For dinner I chose the Italian red blend, surprise. 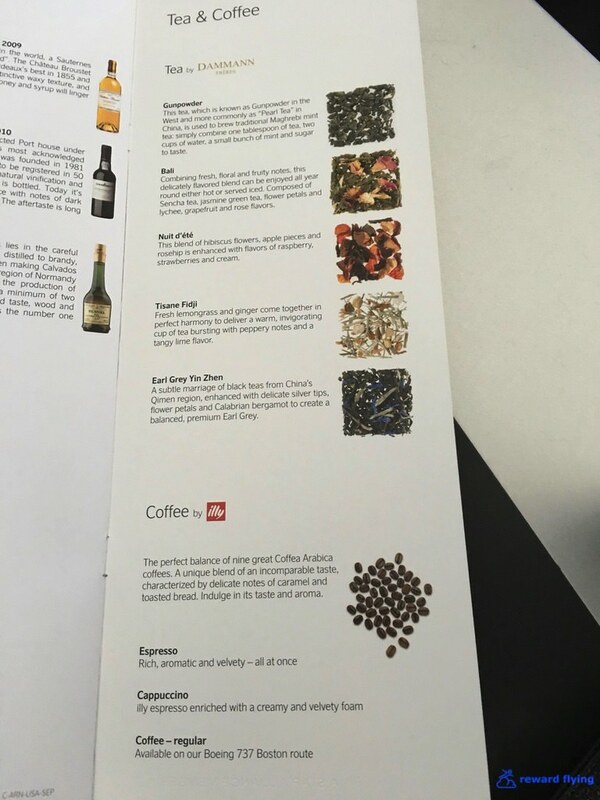 However one of the super friendly flight attendants suggested the Australian Shiraz. Having just been down under I accepted. She did well. Today's menu offered something called Coalfish. With adventurism having been exhausted over the course of this trip, I settled for a simply Coq au vin to go with my Shiraz. SAS serves buffet style on carts. This time they took better care of presentation than my last experience. The cart photographed here being from the second service. We started with, wait for it...., nuts. I enjoyed some Charles Heidsieck to start. I chose the smoked halibut over the peppered beef appetizer. Delicious. 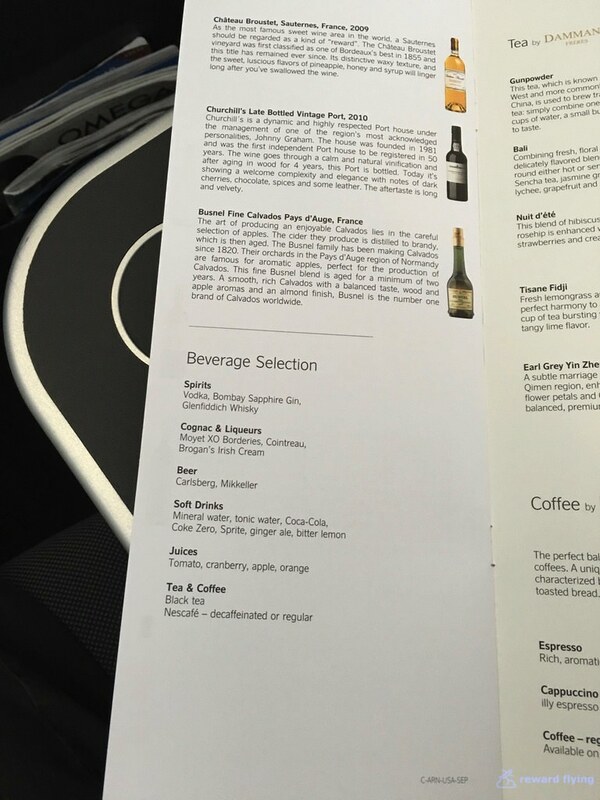 That little bottle of olive oil balsamic dressing is just as popular as Charles Heidsieck on my recent flights. The chicken was good, not memorable but I'd get it again. A snack bar is set up at the back of the cabin. The real goodies had been vandalized by the time I visited. A second service began 90 minutes prior to landing. Served off the cart, it was a delicious selection of salmon, cherry heirloom tomatoes and an interesting spelt with peas salad that was better than good. After too many airplane meals over the 32,000 miles, this one earned a bravo. SAS has a great inflight entertainment systems. It's all touch screen with the optional hand held. My previous experience was at night. Today daylight. An awful lot of glare. I was a little disappointed in today's movie selections, but then again I'd been watching a few on other flights so the current titles I'd seen. Glare or no glare, it never hurts to have a laugh out loud in an airplane cabin. SAS provides business class customers with free Wi-Fi. While I was unable to connect myself, I asked the flight attendant and she got it connected. It took her a good 5 minutes but she was patient and wanted to get it to work. I have to say, for 11 flights I had excellent crews on virtually every flight. While service slipped on a couple and their were a handful of attendants who seemed to only be along for the ride, I felt lucky to have so many great ones. And this flight was no exception, in fact everyone was near the top. Each of them visited and took time to tell stories, help with the wi-fi and the seat. I was never in need of water or anything. While I had not asked for an espresso or cappuccino, when visiting with the purser by the snack bar, he explained that apparently the water in Scandinavia is playing havoc with their coffee machines. He said the aircraft that are based in Denmark don't have issues, but the ones based in Sweden do. Apparently calcium deposits from the Swedish water is clogging the internal delivery system of the machines. They run but don't produce. I was also told about a recent experience where someones' phone fell off their table when landing. It slide under the pod. They had to bring a mechanic on board to remove the pod in order to retrieve the phone. This aircraft was one of their older A330's. Other than the damage to my original 2A seat the aircraft was spotless. Great flight, awesome around the world experience, but this familiar sight was most welcome. Do you have any SAS experiences you'd like to share? Feel free to leave a comment.